Madrid, 25 April 2018 – On this day, the Spanish Brain Council, in collaboration with the European Brain Council, is delighted to organise a roundtable discussion on the off-label use of medicines. The event will bring together around 20 experts and representatives of patient associations, medical societies, as well as pharmaceutical companies, to discuss the conditions for the correct prescription and supply of off-label medicines. 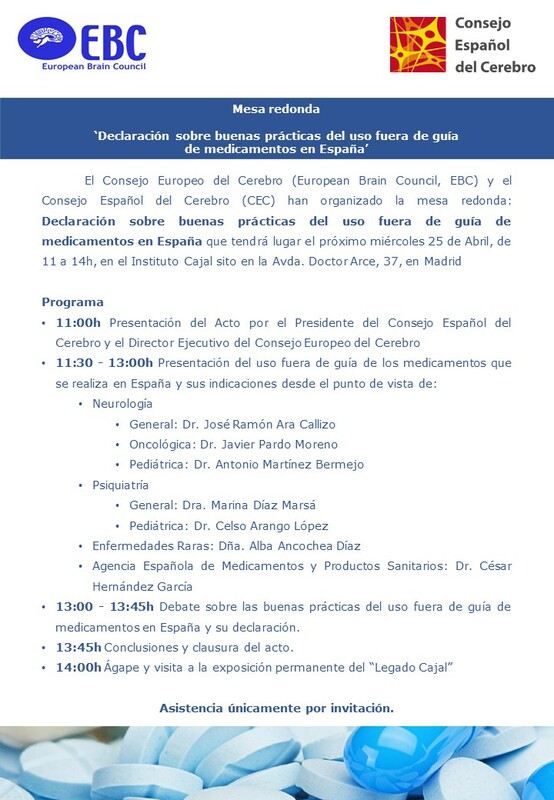 Speakers will include the President of the Spanish Brain Council, Executive Director of the European Brain Council, the Head of Department of Medicines for Human Use at the Spanish Agency of Medicines and Medical Devices, a representative of the Spanish Federation for Rare Diseases and a number of experts in neurology, paediatrics and psychiatry. The event will be an opportunity to present and comment on the Declaration on Good Off-Label Use Practice, known as GOLUP, which includes a collection of best practices in this area developed by European experts and supported by a dozen European and national organisations. This roundtable discussion is organised with the support of EUCOPE, Europe’s principal trade body for small-to-medium sized innovative companies working in the field of pharma, and is part of a series of events held to present the declaration and discuss issues associated with off-label use in various countries in Europe, the first of which took place in Rome in December 2017. The Spanish Brain Council was founded in 2009 as a non-governmental organization that brings together scientific societies, patient associations and industry, with the objective of promoting brain research.